It all began with a 6-month writer’s block. 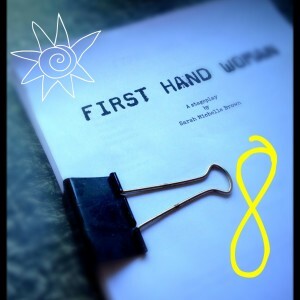 And with only 8 days left until my stage play First Hand Woman‘s American debut at FringeNYC, I’d like to let you in on this little reveal. Back in 2003, I’d attended a screening of a short film that I’d written, directed and produced. It had been doing pretty well in the festival circuit and had gotten some good reviews. But then at this one screening, I saw the film for the first time, as an audience member. When I say this, I mean that I could finally see what I had made through their eyes, not just as a filmmaker, but as someone on the receiving end of the story. It was such a devastating film, and I couldn’t believe that I hadn’t really felt it before. I was so busy expressing something, that I forgot about how I was making people feel. So I never screened that film again. I realized that I had been creating things that I wanted to say, not necessarily things that I would want to see. I decided that I wanted to create something that people would want to see over and over again. I felt driven to create something moving, intense, thought-provoking, but also funny, and at its heart, uplifting – that was the kind of story that I wanted to tell. 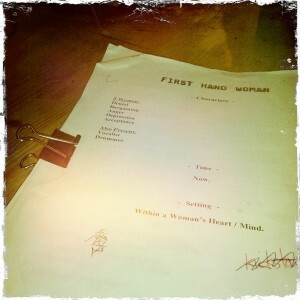 The idea for First Hand Woman came to me. I knew right away that this would be a piece that would be with me for many many years. Not just a show that I would put up once and forget about. I also had a sense that people might actually want to go on this journey with me and feel like this story was also a part of their story. So over the past 9 years I’ve really honed the script. I’ve had a few private readings of it, always asking questions about clarity and about how the audiences felt by the end, so that I could see where the script was working and also where it was falling short. Even at our runs in Montreal and Toronto, I was still chipping away at it. And yep, for New York City, I’ve got some more tricks up my sleeve with a new draft. So what blocks have you turned around in your life? Leave a comment and let me know how you tackled your creative challenges. I’m super curious about this film you are speaking of, now, Sarah!! That is an interesting perspective/moment you had as a viewer…it did sound like people enjoyed the film, though, which is great!! I go through blocks from time to time, and sometimes, I just let it be, until inspiration finds me. It’s hard to force creativity, when it’s just not ‘there’…I totally get that. I think it’s incredible how we can be so deeply immersed in something yet so disconnected from it. It’s a big indication that we’re not exactly where we need to be – yet we almost never realize that until we’re outside of it! My block was my voice – I was in a business partnership and I slowly began to lose my voice and my identity – the business didn’t work out with me in it and now that I am in the right place, i am finding my voice again and realizing how much it was quieted. I have a feeling women everywhere are going to be grateful you got over your writer’s block! I heartily agree Terra about what these kinds of blocks can indicate! Love love love that you are finding your new voice. What an exciting time! Aimelie~ thanks so much for your comments. I love that you dive in despite the blocks! Currently going through a block right now with my business. Have a really significant project that has come my way and there are regulatory challenges (needing licenses that I don’t really need; gotta love bureaucracy) that are literally standing in my way. Was really down about it but pushing through today. Good for you Erica! Keep at it lady! These words gave me chills: “I realized that I had been creating things that I wanted to say, not necessarily things that I would want to see.” I’ve realized that sometimes I’ve had creative blocks because I could not fully receive what I’ve asked for. My powerful desire set something into motion, but I had not yet developed the eyes and ears to recognize it. When I have creative blocks now, I get excited! Because I know that I am about to grow and become MORE of who I am meant to be as I move through this perceived limitation! Oooo Lana, your words gave me chills. 🙂 I love how you embrace your blocks!!! I love what you said about being so in the project that you didn’t actually feel it. It is so powerful that you took that moment of realization and turned it into motivation for creating something that you really, truly want to share with the world. You are doing great things, Sarah. Keep it up!! Thanks so much Shana! It was a tough realization for sure. But I think we need to listen to that voice from within. Especially when it decides to hit you over the head. Lol. Sending positive vibes your way for your amazing debut tonight. I’m a perfectionist, so I know exactly what you’re going through. I’ve finally decided to give myself 2 time limits when working on projects and offerings cause I’ll geek out like no other. Thanks for sharing!!! “I realized that I had been creating things that I wanted to say, not necessarily things that I would want to see.